Tis’ the season for holiday parties, and if you’re anything like me, you’re not only thinking of the parties you’ll be attending but the ones you’ll be hosting too! 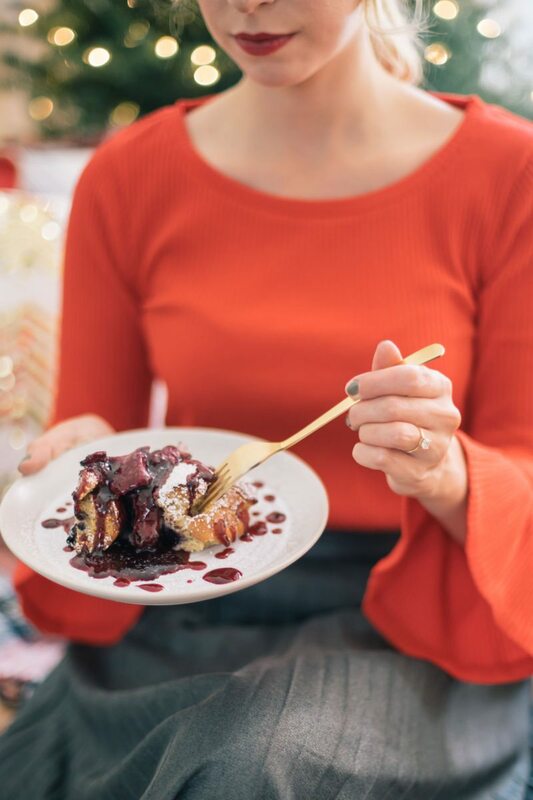 I love entertaining and when it comes to hosting holiday brunch it should feel cozy, well thought out but laid back, and of course, delicious! 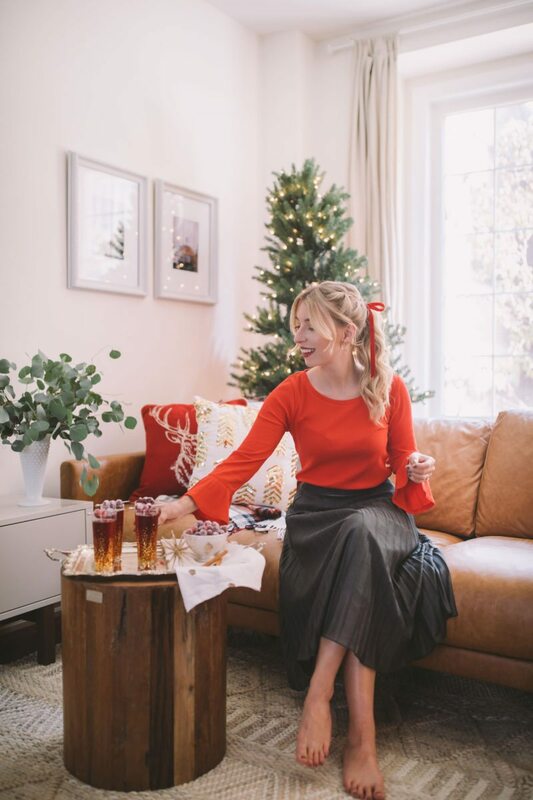 Today I’m sharing my best tips for hosting a holiday brunch from what I like to wear and how I like to style my hair, to what to eat, drink and of course, give as a takeaway. So without further ado, here are 7 ways I go about hosting a holiday brunch. Cozy Atmosphere: Typically, brunch is served early in the afternoon on a weekend so If you’re hosting a morning brunch, it’s nice to be mindful of that. Guests will have probably woken up early to get ready and were perhaps out the night before. When guests arrive, be sure to tell them right away that you want them to kick off their shoes, relax and simply enjoy each others company. 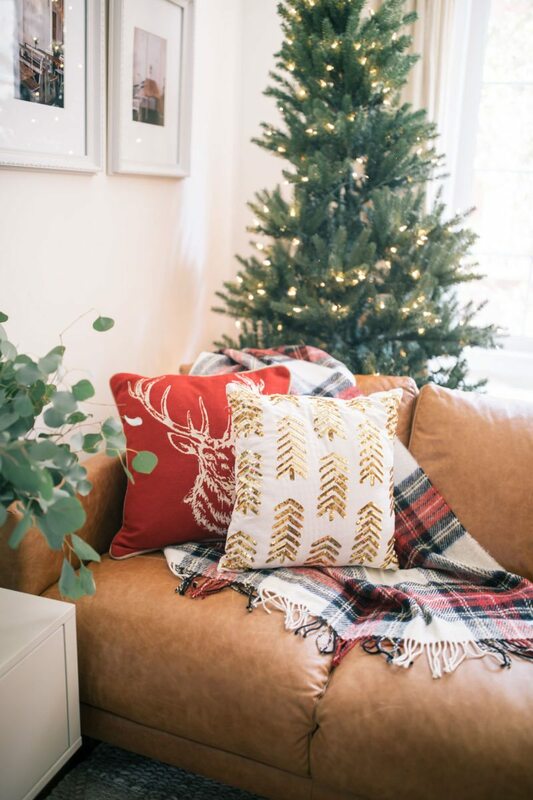 I like to have cozy blankets and holiday-themed pillows readily available so that whoever is arriving knows that they are more than welcome to take a seat and snuggle in. When guests arrive, I also like to have a couple unscented (more on that below) candles burning to set a relaxed atmosphere. I always have coffee, a selection of teas, a few small pastries and a fruit tray ready for guests to nibble on while brunch is being prepared. A Holiday Playlist: Speaking of a cozy atmosphere, it is always a good idea to have some holiday music playing when guests arrive. I know that some people aren’t huge fans of holiday music, but I feel like it is a great way to get guests into the holiday spirit and it makes me so happy! Dress The Part: Though brunch is meant to be pretty casual, I have a tendency to want to dress up, especially around the holidays. For holiday brunch, I usually opt to wear something that looks stylish but will still allow me to comfortably move around and serve my guests. I normally go for a knit top in a festive color (like the red one here) and a flowy, sparkly skirt. They are both super comfortable options but still make me feel a little fancy. 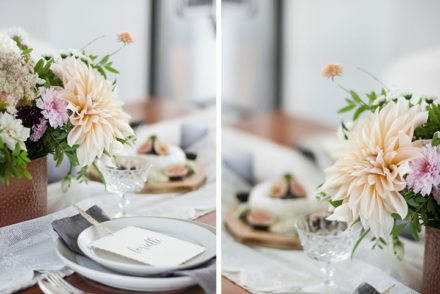 Let your guests know in advance that if they’d like to dress up they’re more than welcome to, but it is not required and shoes definitely don’t have to be worn! 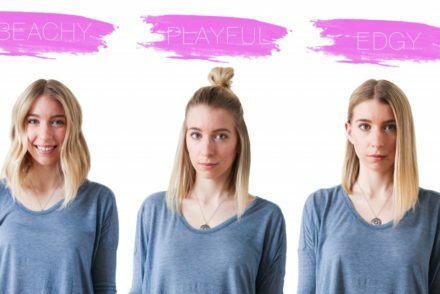 Easy, Effortless Hair-do: When entertaining the last thing that I want to worry about is my hair, and I’ve found that the easiest way to not worry is by wearing my hair up. 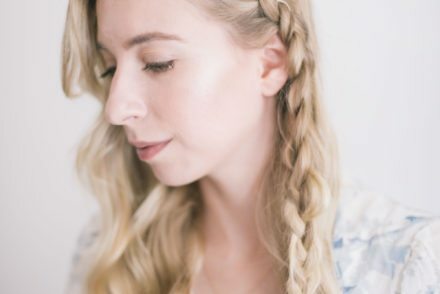 This French-braid ponytail has been my go-to look this holiday season and I’m so happy to be showing you exactly how to create it over on the Shoppers Drug Mart website. Make sure to click-through to see exactly what products I used and a step-by-step tutorial on how to achieve this look. 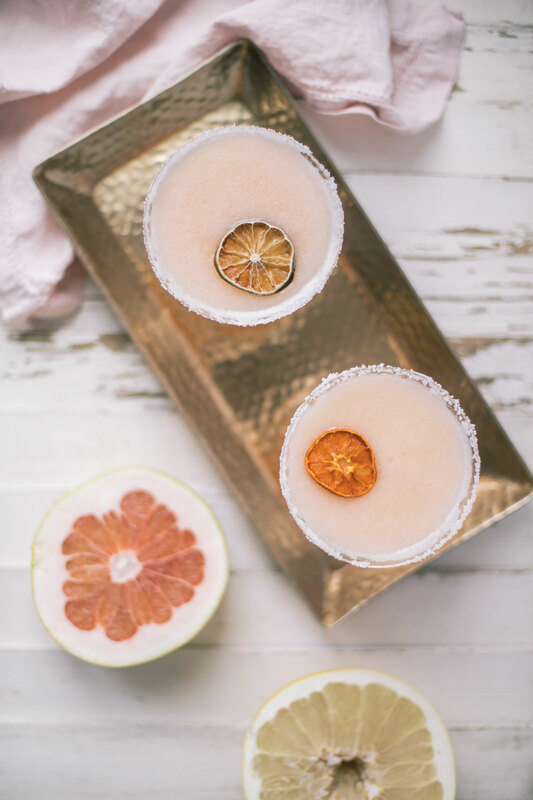 A Custom Cocktail: There is nothing that says brunch like a mimosa, am I right? During the holiday season, I like to swap out the orange juice for cranberry juice and garnish my cranberry mimosas with sugared cranberries. 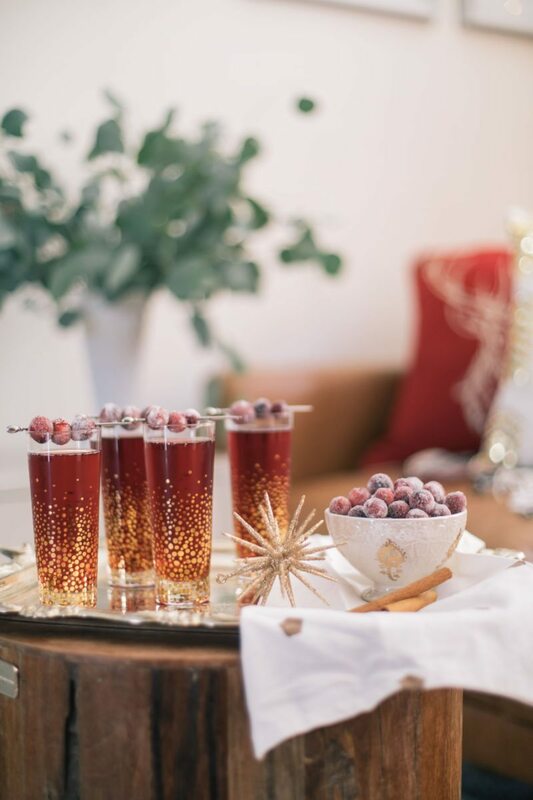 These cocktails are probably the simplest of cocktails to whip up at just half parts champagne and half parts cranberry juice and they look so beautiful, especially with the sugared cranberries which can be made the night before. Food You Can Prep the Night Before: If I’m going to be entertaining, I want to spend as little time in the kitchen as possible so that I can not only tend to my guests in other ways but also inject myself into the conversations. I found the most delicious recipe for baked blueberry French toast which can all be prepped the night before and simply popped into the oven when your guests begging to arrive the next morning. Between the small pastries, I like to serve, fruit tray, oven baked blueberry French toast, and cranberry-mimosas, your guests will be leaving full and completely satisfied. A Thoughtful Takeaway: One of my absolute favorite parts of the holiday season is the classic “scent of the holidays”. I choose to burn unscented candles because I love to have a stove-top potpourri going for the entirety of the brunch. I simply add water, cranberries, oranges, a few cinnamon sticks, star anise and a dash of nutmeg into a pot and keep it on a low simmer. It makes our entire home smells like Christmas which feels so comforting. Another fun idea is to have a little station set up with all the ingredients (except cranberries and instead of fresh oranges, dried) ready with muslin bags and ribbon so that my guests can make a little DIY potpourri takeaway. 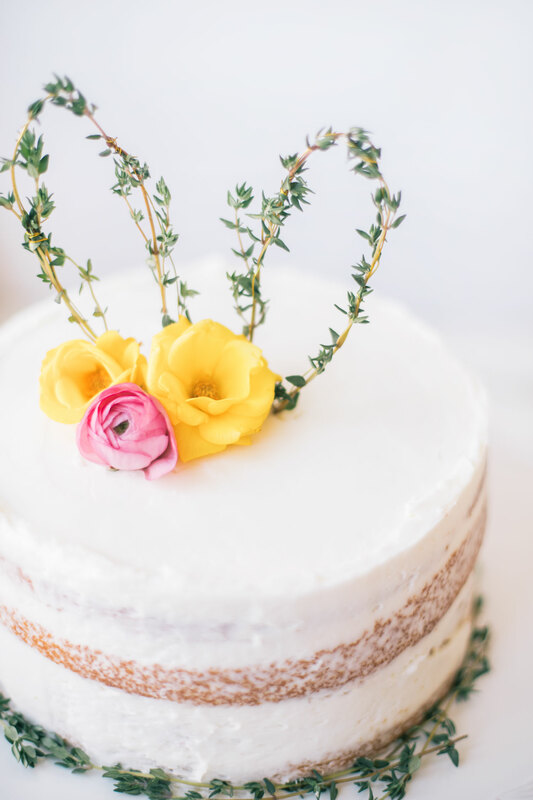 Having a small gift that guests can bring home is such a simple way to show that you have thought about them and are appreciative of them taking the time coming to your holiday brunch during the busy holiday season. And there you have it! 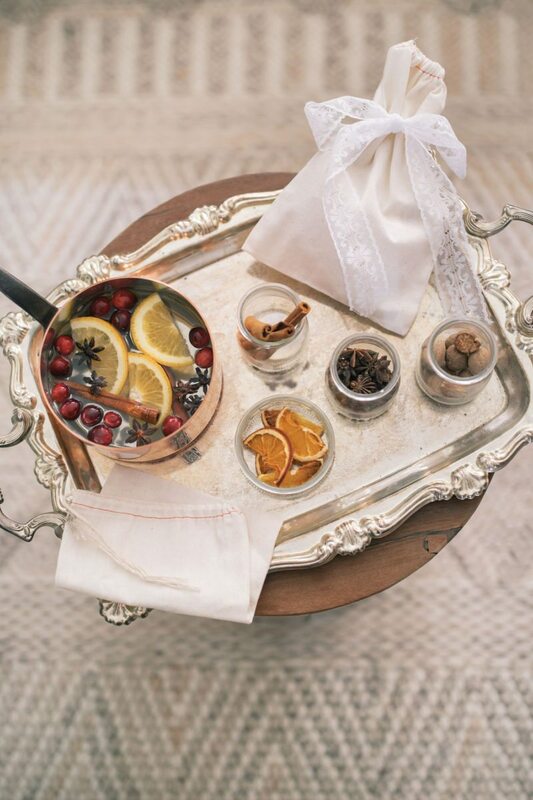 My 7 tips for hosting the perfect holiday brunch. And don’t forget to head on over to the Shoppers Drug Mart website for the full tutorial on how to create my braided ponytail. This post is brought to you in collaboration with Unilever.